Adults allowed to bring personal cooler or beverage of choice. 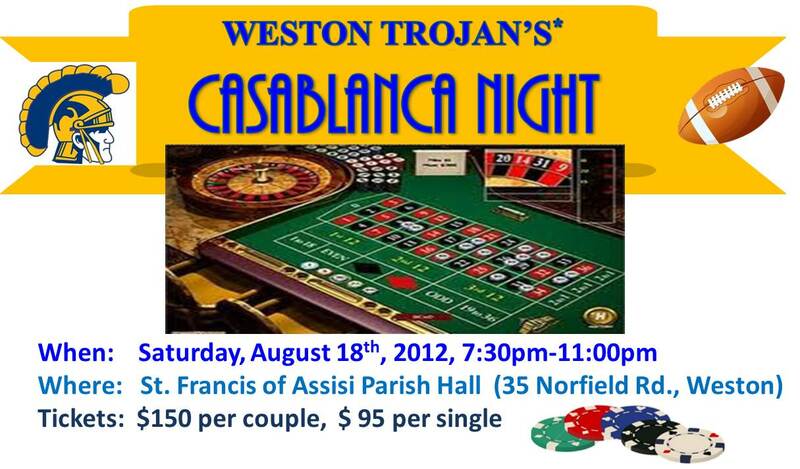 Join Trojan Football & Cheer supporters* for an entertaining evening of casino games, great food and fabulous prizesto benefit Weston football & cheer! Fun for gamers, watchers, and just plain talkers! Black Jack, Roulette, Money Wheel & More! Ticket includes first round of game chips, heavy hors d’oeuvres and beverages. BYOB welome. Additional game chips on sale – and expected! But it is a fundraiser – no “cashing out”! Doors open at 7:30pm, game tables open at 8:00pm. Great food, grand prizes for high rollers, a silent auction and "Trojan Chip" prizes throughout the evening! --Click Here for Casablanca Invite to Share or Post! --Click here for Adobe PDF flyer handouts in "Documents." July 17 Prize Press Release - Click Here! 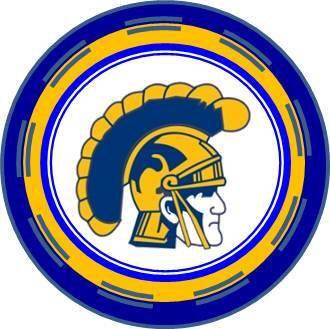 *Weston Gridiron Club and Weston Trojan Youth Football & Cheer are teaming up to raise money for Trojan football and cheer in Weston, grades 1-12. In 2012, Gridiron will spend over $30,000 for coaches, camps, equipment, payments on the stadium bleachers and Booster Barn, and such vital expenditures as the website. In its inaugural year, WTYF&C has similar expenses for fields, coaches, lights and equipment. Neither program can make it without fundraising. Both the Gridiron Club and WTYF&C are independent 501(c)(3) charitable organizations.